Budget kitchen design sometimes seem impossible, but with careful planning and shopping you can do this! Kitchens are the heart of the home and a kitchen update on a budget is something that I have planned for our beach home and can’t wait to share soon. I’ve been searching and pinning kitchen renovations that appeal to me and sharing some ideas with you today. 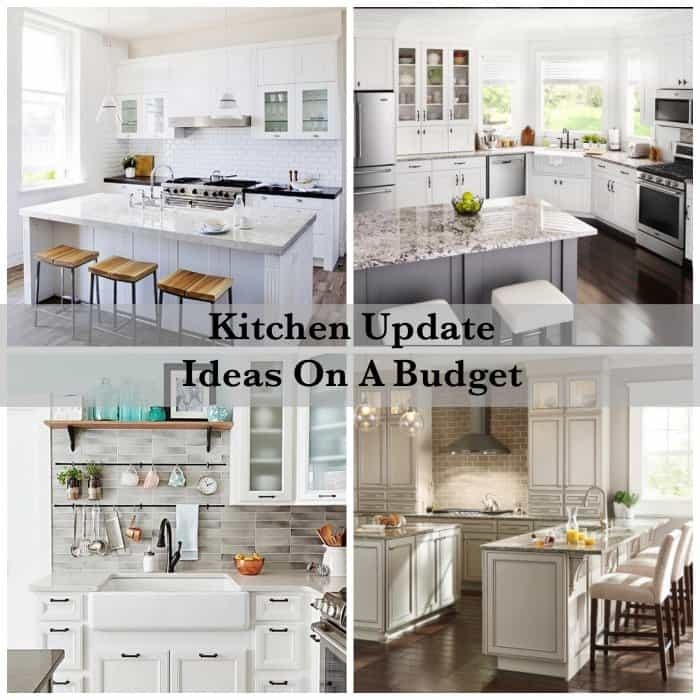 There are so many elements to great budget kitchen design, but don’t let that intimidate you since there are smaller projects that can be done to give your kitchen a whole new look too. You can design your space and plan your budget when shopping at Lowe’s with a project specialist and that just makes life a whole lot easier. Updating the light fixtures can be done on most any budget and will give you a new look in any room. Simple glass pendant lighting is practical, easy to keep clean and on trend for today’s busy lifestyle. Pendant lighting looks great in multiples over a kitchen island or work area. Lighting is key in a space where you will be cooking and spending time with the family and the kitchen is the heart of the home. I’ve shared one of my favorite picks for lighting above that you can find at Lowe’s and there are lots of choices for your own particular style. Cabinets can be a big commitment and are one of the most important elements in kitchen design. I have always had white cabinets in our home and they reflect the light and are easy to clean. I prefer to have a mix of solid doors and glass front doors, and love the look of today’s frosted cabinet doors too. Shaker cabinets so popular right now but I believe will stand the test of time and are worth investigating. Lowe’s has a really nice selection for budget kitchen design. Farmhouse sinks are not just for farm houses and come in more than just the classic white look above! We are ordering a stainless steel farmhouse sink for our beach home and love the more classic almost industrial feel. One of the best things about a farmhouse style sink is the large bowl that makes it easier to wash big pots and platters or bathe the dog (or 3, in our case:-). Kitchen faucets sure have come a long way over the last few years in both looks and functionality. A high-arc kitchen faucet allows you to place a large pot to fill underneath without having to remove the faucet from it’s station and potentially create a big wet mess. I always consider both form and function when shopping for items for my home and in the kitchen it’s crucial to be somewhat practical in your choices. When we first purchased our beach home about 14 years ago we made a small change that had a large impact in the kitchen by adding some colorful backsplash tile where they was simply a blank wall. It wasn’t very costly, and it made the room look much more finished. We have just completed a redesign and we work with a budget, especially since it’s our second home. See more IN THIS POST. I really love the on trend yet timeless white subway tiles and glass tile and will be showing you what we have picked soon! Look for what subway tile at Lowe’s for a great selection that will fit your budget. « Our New Beautiful and Low Maintenance Pergola! Hi. I searched on kitchens, and read your remarks on countertops. I just have to share that my dream countertops have been Corian since I first saw them in the 1980’s. What I love about them is how you can get an integral sink that is sealed so it looks like all-of-a-piece with the counter and you can’t even see the seams. It’s so clean looking! You can just sweep the crumbs into the sink and there are no little spaces above or below the sink for stuff to stain or get stuck in. I’ll be realizing my dream and getting them soon. I’m even going to get a wall-mounted faucet, so the counter can be completely clear. (I’m swooning now. LOL) I can’t wait. Love your blog; I’m grateful for your contribution to my enjoyment of homemaking.